Summertime in New Jersey bring to mind three weather phenomena: Heat, humidity, and thunderstorms. We will experience all three on Tuesday, to an extreme degree. Weather transition days are usually pretty wild, and this will be no exception. Additionally, a strong cold front is approaching New Jersey, which will eventually deliver slightly cooler and much drier air. This air mass boundary will also combine with our hot and humid atmosphere to spawn a line of strong thunderstorms, with some very heavy rain. --Heavy rain leading to flooding. The potential is pretty high for 1 to 2+ inches of rain in a very short period time, leading to rising water along roads, streams, creeks, and other low-lying areas. Remember to never drive, walk, or swim through flooding areas — even a shallow flow of water can be incredibly powerful. --Frequent cloud-to-ground lightning. By definition, every thunderstorm has lightning. And lightning is always potentially dangerous. When thunder roads, head indoors. --Damaging wind gusts. 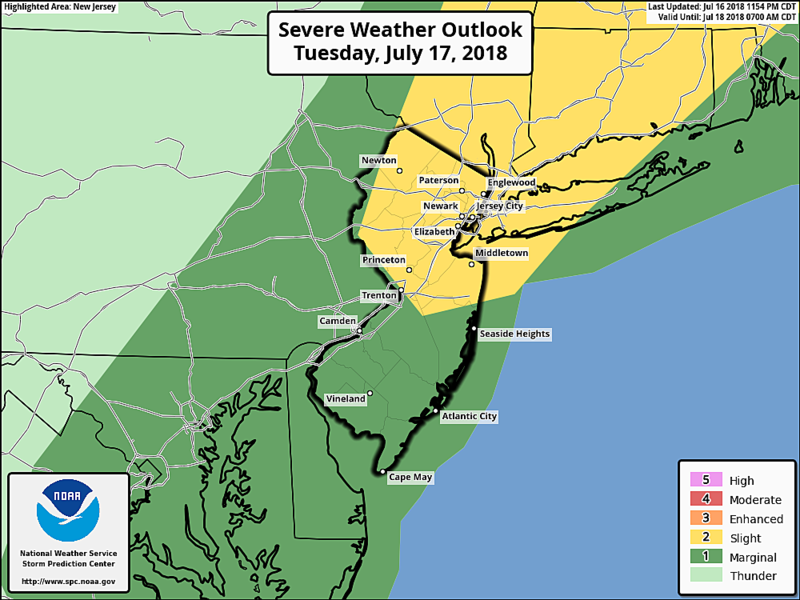 The Storm Prediction Center has northern NJ in a "Slight Risk" (category 2 of 5) for severe weather, with southern and coastal NJ in a "Marginal Risk" (the lowest category). If the storms really sharpen up, resembling either a "supercell" or "squal line" structure, we could see a swath of 60+ mph wind gusts. Small hail is possible too. A Flash Flood Watch has been issued for a swath up the NJ Turnpike corridor, from midday through late evening Tuesday. --A Heat Advisory continues for northeastern New Jersey (Bergen, Essex, Hudson, eastern Passaic, and Union counties) until 6 p.m. The heat index ("feels like" temperature) may climb into the mid 60s by early afternoon, right on the edge of dangerous heat. Staying cool and staying hydrated will be very important all day. 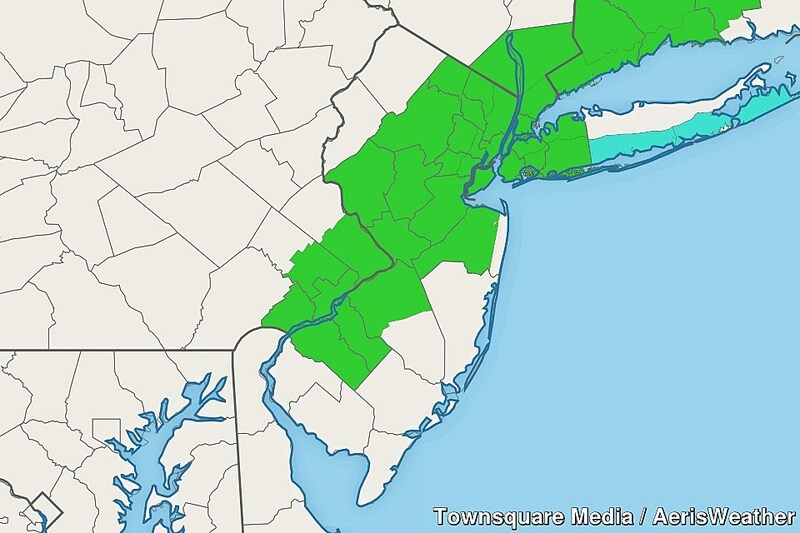 --A Flash Flood Watch has been issued for most of the state, generally along the NJ Turnpike corridor. The watch is in effect from 11 a.m. to Midnight for northwestern Burlington, Camden, Gloucester, Hunterdon, Mercer, Middlesex, inland Monmouth, Morris, Somerset. This watch is effect from Noon to 10 p.m. for Bergen, Essex, Hudson, Passaic, and Union counties. A Flash Flood Watch means heavy rain may lead to rapidly rising water in low-lying areas. Road closures and other travel difficulties are possible. --A Moderate Risk of Rip Currents has been posted for the entire Jersey Shore once again. Even though most of the day will be a "decent beach day," the ocean will be churned up a bit. Ocean waves 3 to 4 feet. 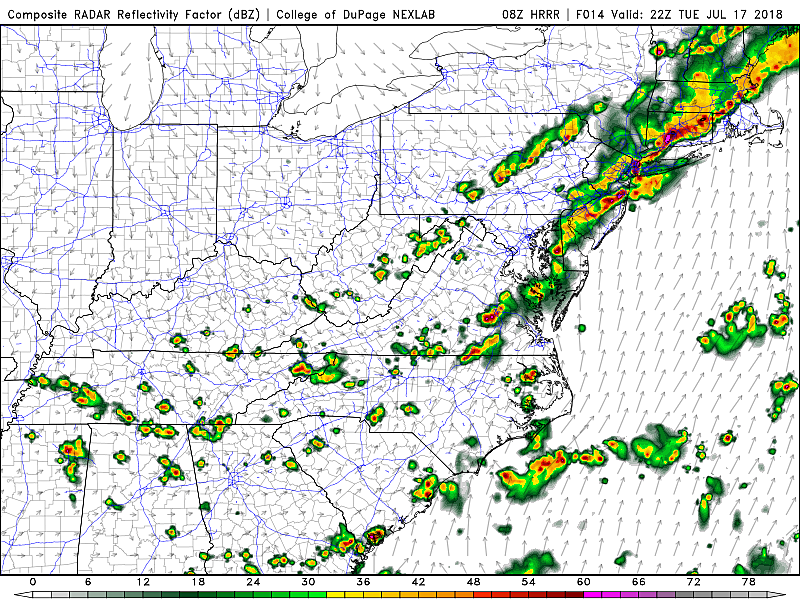 Again, primetime for severe weather will be about 3 p.m. and 8 p.m. Any rain and thunderstorms are expected to exit the Garden State Tuesday evening, by about Midnight at the latest. Behind the rain will come the glorious cold front, and our atmosphere will thoroughly clear out and dry out overnight. Low temperatures should dip into the 60s across the state. Wednesday looks amazing. We'll enjoy mostly sunny skies, warm temperatures in the 80s, and hardly any humidity in the air. (Seriously, dew points in the 40s in summer?!) It will be a refreshing, comfortable, and incredibly pleasant day. We'll do it again on Thursday. Lots of sunshine, with highs in the lower 80s. Friday looks good too, with partly sunny skies and high temps returning to the mid 80s. Looking ahead to the weekend, I think Saturday will be the nicer and drier day of the pair. A stiff breeze out of the southeast (a sea breeze) will keep the Shore cooler and cloudier. Further inland, it will be partly sunny with highs in the lower to mid 80s. Any shower should hold off until Saturday night. And then, on Sunday, we'll dive into an unsettled, occasionally stormy, occasionally wet pattern that looks to stick around for a while. It could literally rain somewhere in the state every day from Sunday (7/22) through the end of the month? Yeesh.